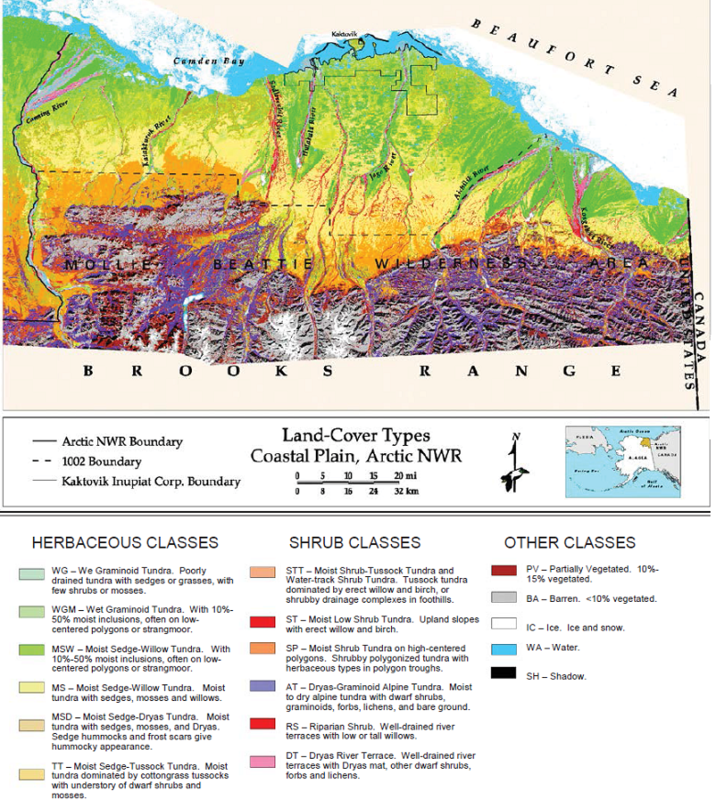 This data set provides a landcover map with 16 landcover classes for the northern coastal plain of the the Arctic National Wildlife Refuge (ANWR) on the North Slope of Alaska. The map was derived from Landsat Thematic Mapper (Landsat TM) data, Digital Elevation Models (DEMs), aerial photographs, existing maps, and extensive ground-truthing. The data used to derive the map cover the period 1982 to 1993. The study area included 18,510 km2 of the coastal plains and adjacent mountains of the larger ANWR. The area is bounded by the Canning River to the west, the Alaska-Canada border to the east, the Beaufort Sea to the north, and the Brooks Mountain Range to the south. Foothills are the most common terrain type in the study area. There is one data file with this data set in GeoTIFF (.tif) format. Figure 1. Land-cover map of the Coastal Plain, Arctic National Wildlife Refuge, Alaska, 1993. Sixteen land-cover types are noted, with a 17th notation for shadow (Jorgenson et al., 1994). The study area included 18,510 km2 of the coastal plains and adjacent mountains of the larger ANWR. The area is bounded by the Canning River to the west, the Alaska-Canada border to the east, the Beaufort Sea to the north, and the Brooks Mountain Range to the south. Foothills are the most common terrain type in the study area. The area includes calving grounds of the migratory Caribou herd and is a nesting habitat for many birds and waterfowl (Jorgenson et al., 1994). Arctic_Wildlife_Refuge.tif Land-cover and vegetation map of a portion of the Arctic National Wildlife Refuge in GeoTIFF (.tif) format with 16 land-cover classes and two additional classes: a class for shadow and a class for unprocessed, poor data quality pixel. Table 5. There are two companion files with this data set, which provide detailed information on the mapping project. These data provide a record of vegetation and landcover for the time period 1982 - 1993 for the area and could be useful to climate change studies. The agreement between the final map and 318 independent field samples was 50% for 16 land-cover classes. Agreements for both Landsat images were the same. The agreement level of 50% suggests that 16 land-cover classes may be too many to distinguish accurately in this area using the Landsat and ancillary data available at the time (Jorgenson et al., 1994). The study area for the mapping project included 18,510 km2 of the coastal plains and adjacent mountains of the larger Arctic National Wildlife Refuge (ANWR) in Alaska. The area is bounded by the Canning River to the west, the Alaska-Canada border to the east, the Beaufort Sea to the north, and the Brooks Mountain Range to the south. The area includes calving grounds of the migratory Caribou herd and is a nesting habitat for many birds and waterfowl (Jorgenson et al., 1994). Foothills are the most common terrain type in the study area. Tundra with sedge tussocks and dwarf shrubs covers most foothill uplands. Dominant plants include sheathed Cottongrass (Eriophorum vaginatum), numerous ericaceous shrubs, dwarf birch (Betua nana) and diamond-leafed willow (Salix planifolia ssp. pulchra). Frost scars occur on most upland surfaces and may cover up to 90% of the surface. Mountainous terrain occurs only in a small portion of the study area, near Sadlerochit Spring (Walker et al., 1982). Figure 2. 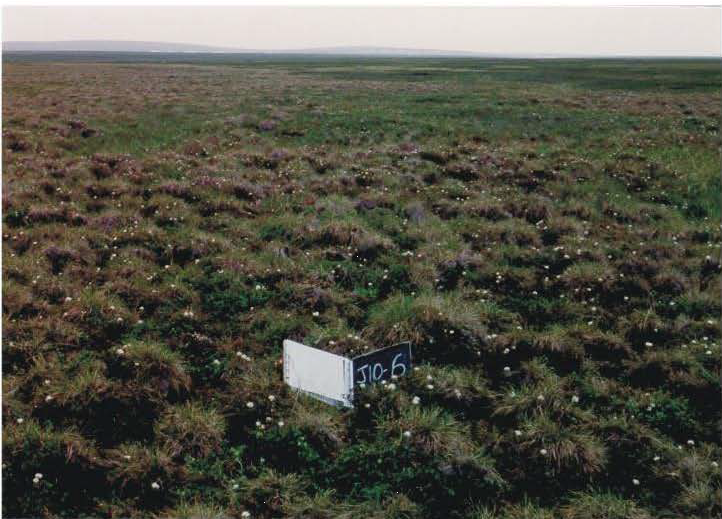 Moist Sedge Tussock Tundra with approximately 20% tussock cover (average for this class) (from Jorgenson et al., 1994). Figure 3. 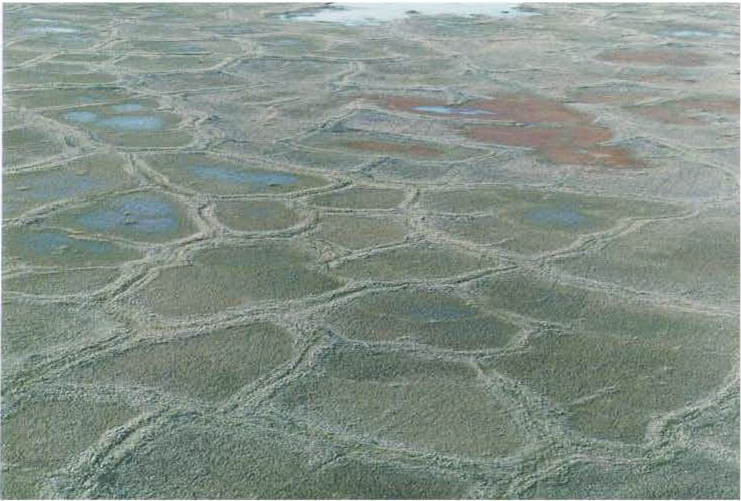 Wet Graminoid Tundra with moist inclusions in low-centered polygons, with wet sedge in centers and troughs and moist sedge on rims (from Jorgenson et al., 1994). The map was derived from two Landsat TM images; one from July 7, 1985, and one from July 15, 1986. The two images were georeferenced to UTM Zones 6 and 7 using a second-order transformation and nearest- neighbor resampling. A map of physiographic terrain types was digitized. Five major terrain types had been mapped and described during the making of the 1982 map (Walker et al., 1982). A map of riparian zones was digitized from active floodplains, islands, and low river terraces identified from aerial photographs. Two sets of vegetation field data were acquired; one set for training data and one to assess the map accuracy. Most field data used to develop the map were collected in the summers of 1989 and 1990 before the Landsat-TM data were classified. Therefore, field sites were chosen based on distributions of vegetation types on the ground, not on distributions of spectral classes from the Landsat-TM images. General areas of representative vegetation were identified from color-infrared (CIR) photographs. In early 1993, preliminary maps of the two separate Landsat-TM images were completed and evaluated during the summer field season. Enlargements were made for 17 areas that represented a variety of vegetation and terrain types. These areas were ground truthed by by botanists to determine if corrections needed to be made. Final changes were made and the two maps were joined (Jorgenson et al., 1994). Jorgenson, J.C., P.E. Joria, T.R. McCabe, B.R. Reitz, M.K. Raynolds, M. Emers, M.A. Wilms. 1994. Users guide for the land-cover map of the coastal plain of the Arctic National Wildlife Refuge. U.S. Fish and Wildlife Service, Fairbanks, Alaska, USA. Walker, D.A., W. Acevedo, K.R. Everett, L. Gaydos, J. Brown, and P.J. Webber. 1982. Landsat-assisted environmental mapping in the Arctic National Wildlife Refuge, Alaska. CRREL Report 82-27.